One is off to Sunny Spain…. 0L6:C from Pladda is our first gull to head to Spain this year! He left Ayrshire on the 27th of June arriving in Northern Ireland where he remained until the 9th of July. He then headed down to Dublin where he spent a few hours around the Damastown Industrial Estate before heading off just after 2030. He was off the coast of Courtown at 0036 on the 10th of July and recorded off the Cornish coast at 0437. He continued south and was off the coast of France at 0839. 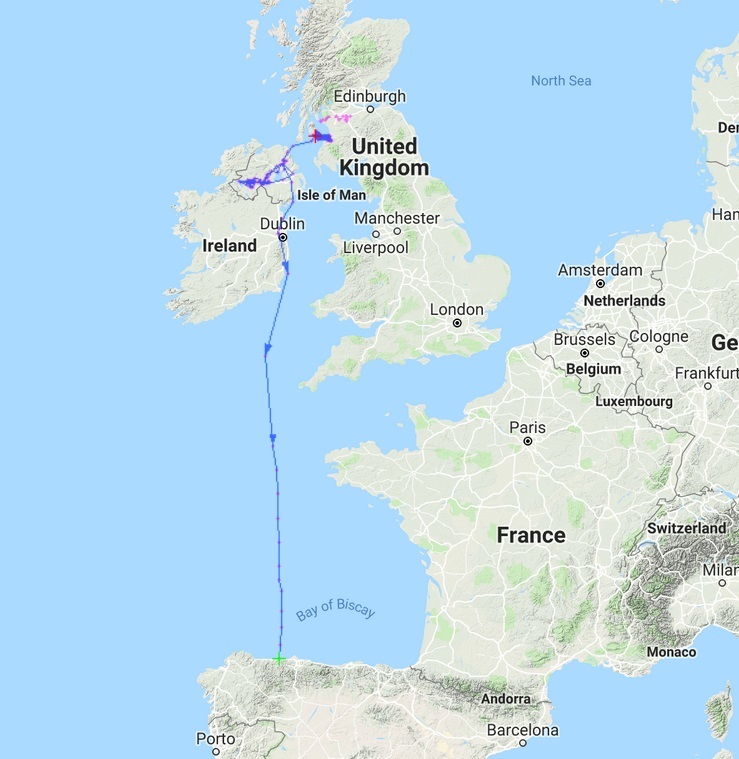 At 1951 last night he arrived on the north coast of Spain after flying across the Bay of Biscay. He spent 23 hours flying. What a feat. Last year our first bird (Flyback) arrived in Spain on the 31st of July. 0L6:C has arrived 3 weeks earlier. Is this a sign of a bad breeding season and where will he go next?